I started studying classical clarinet around 9 years old and continued through high school but when I saw the high school dance band I was forever hooked on jazz and picked up the tenor sax at 15 years old. I was mesmerized the first time I heard Stan Getz play "Desafinado" and his "Focus" album when he improvised over edgy string/jazz rhythm section movements. Then I discovered Bird (Charlie Parker), Lester Young, Coleman Hawkins. I love anything Dexter Gordon played, took me awhile to get into Coltrane. The jazz tenor sax players alive now in my opinion are just as great as the Masters of the 1940-1960s like Scott Hamilton, Harry Allen, Dave Liebman, Joe Lovano, Grant Stewart, Eric Alexander. Michael Brecker now fascinates me but ironically not when he was alive. As much as I love jazz, for the last 40 years I played weddings, Rock, R&B and played for a couple of years on the Doo Wop tribute circuit with the Del Vikings while I had a day job career. Sad to say in the USA it is difficult top play pure jazz gigs because not a huge audience and guys like me can't compete with the great USA jazz musicians chasing those gigs. When I was in the US Air Force in late 1960's it was the only time I got paid to played "pure" jazz when I was stationed in Pakistan ( not as dangerous as now), it was GREAT!! I have always loved to practice to keep my chops and confidence up. I retired from my day job about a year ago and went on a mission to improve my chops and technique and to play more melodically. I now exclusively play Tenor Sax even though I played clarinet and flute on gigs when I was younger. For me it's too difficult to keep a decent embouchure just on one instrument. 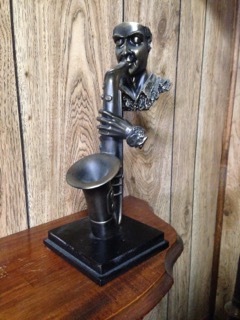 I have a Selmer Mark VI Tenor Sax I bough new in the early 1970's to replace student Conn I had. I now have 3x Yamaha Custom 82Z Tenor Sax that I play exclusively. But when they are on the blink, I still think the Selmer Mark VI might sound better. I still have my original Buffer clarinet and a flute. When I retired I bought a electric piano but still haven't learned much to play it.